CCA Kids Blog: Donate NEXT for North Texas Giving Day #NTXGivingDay Thursday! Donate NEXT for North Texas Giving Day #NTXGivingDay Thursday! Mark your calendars for SEPTEMBER 22, 2016. 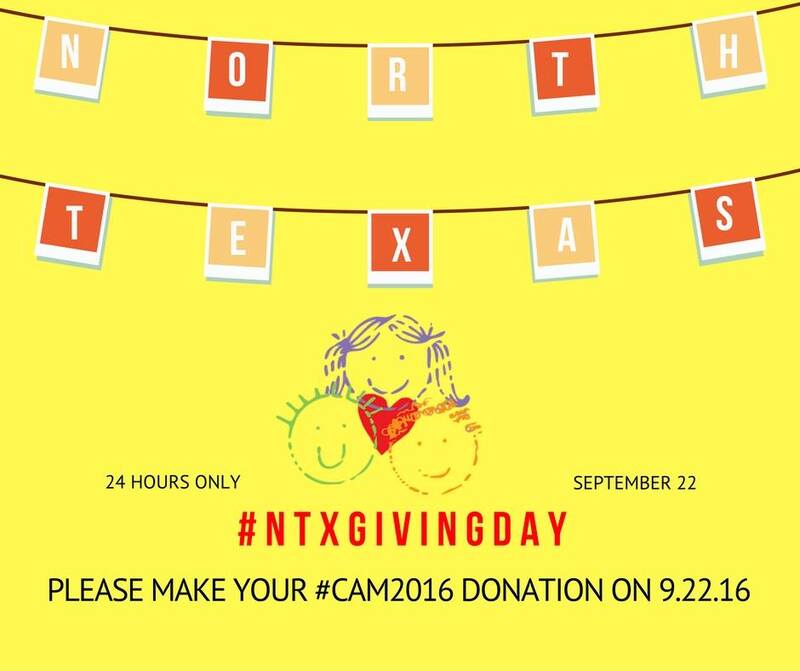 If you plan on making a donation in honor of #CAM2016, we ask that you make it through the official North Texas Giving Day donation page, so that CCA will raise money and garner a portion of the bonus prizes available to those organizations that meet certain fundraising benchmarks. Anyone, anywhere can donate. no amount is too small or too large! This is a critical day of fundraising for our efforts that lasts us all year long. North Texas Giving Day began seven years ago created by Communities Foundation of Texas. The day-long giving event helps benefit non-profit and charitable organizations of all kinds located in Texas. There has been steady growth over the last seven years. In 2009, a number of non-profits joined forces to raise $4 million dollars. In 2015, over 25 companies, thousands of individual donors, others raised $33 million for non-profit organizations, making #NXTGivingDay one of the top-grossing fundraisers in the United States. North Texas Giving Day is a shining example of a large group of dedicated people Working together to benefit many, many lives. What can you do to help make this year bigger and better than ever? 2) Place this link to our North Texas Giving Day page in your social media posts, on your blogs, or via email to friends and family. 3) Shamelessly tell the world why Children's Craniofacial Association is so great and why they should give on September 22nd in particular. Ask yourself, what impact has CCA had on your life? Share your story with anyone who is kind enough to listen.